Okay, extreme title, I know. But I have been thinking more and more about why I grow, and why I preserve things. Particularly when I am pruney fingered from skinning too many tomatoes. So I thought I would make a list. 1. Money savings. Seriously insane. I have now grown enough tomatoes for the whole year, some frozen, some in jars. All for the cost of about $30. The thing is, I could have grown them cheaper by using seeds… but I was too slow. (Again I am blaming the fact I was in London instead of gardening last spring.) I have this apple tree out back. We didn’t plant it, and my husband hates it. 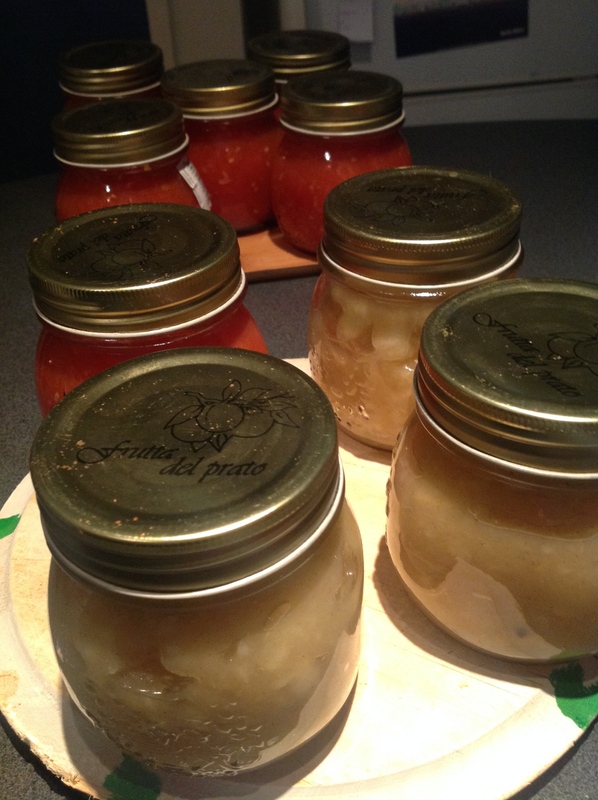 But the thing just provided me with jars of stewed fruit…. for pretty much free. I have enough jam for the year now for again, pretty much free. 2. I know where my food comes from. Now, this is important. While I have been overseas, which isn’t as much as I would like, but it has been a fair amount, I have noticed a confusion over food. In Samoa and Norfolk Island, people eat what grows locally. Imported food is too expensive. In London, food was cheap, but I never saw anywhere growing anything. It all came in on trucks. In China, I taught kids who didn’t know what a sheep was and yet they ate lamb. It’s important to know where food comes from, what it has grown in, and when it was picked. It’s just better that way. 3. Global population crisis. Okay, again, I am erring on the side of hyperbole. But the population is expanding and pressure on world food sources is growing. And I really do believe we can all help matters by growing things ourselves. Simply put, we can all grow something. You can grow herbs indoors, lettuces in pots, beetroot in even the shadiest, poorest soil… so many options. We can all grow something. So that’s my general rant. But there are other reasons. 4. It’s theraputic. Seeing something grow and then turning it into something else, its just lovely. 5. It’s super healthy. Not just the eating, but the exercise from tilling soil, planting, pruning, harvesting and preserving. 6. It’s virtuous. Just try mentioning that you grew your lunch at work. Trust me, you get a mass feeling of superiority. And it is awesome. Anywho, I preserved apples and tomatoes today. Apples are simple. Slice, coat with lemon juice, add a little sugar, cinnamon, and cloves. Bring to the boil with a little water to get it going. Cook until you have a rolling boil. Boil for another 5 minutes. Pop into sterilized jars. Trust me on this…. get an apple slicer and corer. Life is better that way.